Pâtisserie Joyeux is a popular pastry cafe found in School Garden. Though the establishment is relatively small and the prices a little more expensive than usual, the baked goods at the Joyeux are famous for their high quality. It also serves good tea and coffee, though most people would prefer the Kadokado Café's more modernized beverages. The chef, the kind, gentle, and seemingly well-bred Hitomi Yoshikawa, is often seen during weekends shopping, hand picking the very best ingredients for her little pastry store. 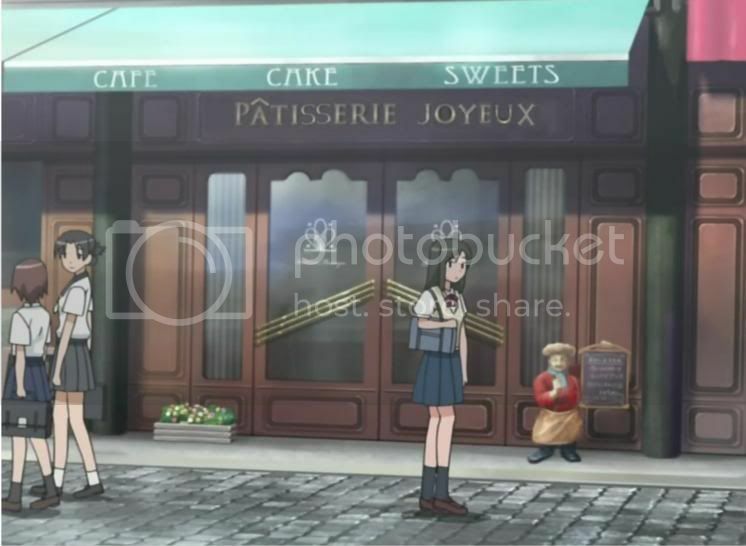 As the store is located in School Garden, most of the customers are middle school and high school students wanting to unwind from a day of classes with a Joyeux Strawberry Crêpe or a Chocolate Mousse Cornet, many of them female (though male students can often be found there, sometimes because their girlfriends dragged them along). On Valentine's Days and White Days, the store tends to become jam-packed with girls (on Valentine's Days) and boys (on White Days) trying to buy chocolate for their dearly beloved. Due to the chaotic environment of the store on these days, customers are advised to avoid Joyeux on February and March 14th. Rumor has it that a trio of hoodlums once tried to rob the store in broad daylight, right after school hours, believing that they could easily cow the store owner and the dozen or so students with sufficient yelling and posturing. Their plan backfired when about 8 of the customers turned out to be level 4 ESPers and another one a level 5, who were understandably upset about having their daily allotment of processed sugar denied to them. When queried about this incident, Ms. Yoshikawa tends to simply laugh and claim that it was only two hoodlums.